…but I’m going to write a post about student films! As you might know, my biggest goal for 2010 is to “break into” film acting. And by that, I simply mean to start filling the gaping void on my resume under the “Film” heading. My entire career has been spent on stage, so I figure it’ll be wise to explore a fun new medium. Get on ActorsAccess.com. Check! Such a great tool for actors! Submit, submit, submit! Check! I recommend paying the yearly $68 as opposed to the $2 for each submission. It makes submitting to multiple roles much easier! 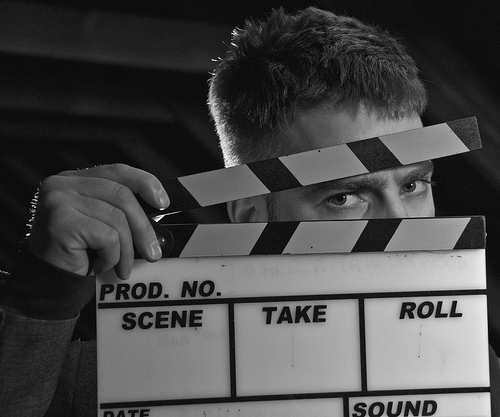 Columbia College, DePaul University, and The School of the Art Institute of Chicago are just a few institutions where the great filmmakers of tomorrow are getting their feet wet, and they deliver plenty of opportunity for aspiring on-camera actors to do the same. Appreciate the journey. Take in every little moment of the process and appreciate its worth. How long did the commute take? How did the specific outfit you were wearing affect your audition? Are you noticing any common motifs from audition to audition? Classes are a fantastic tool, but you’ll do your best learning & growing on the playing field. If you’re not having fun, you’re not doing it right! Keep in mind that as actors, our primary job is to audition. Forget about trying to get the part: For these few minutes, you actually get to play the part! Have fun! Give them your best You. Gandhi said, “Whenever you have truth it must be given with love, or the message and the messenger will be rejected.” The easiest thing you can do in an audition is to be professional and smile! Show up early and prepared! Treat every audition like the biggest audition of your life, and leave the casting director with a favorable impression of you as a person. Accomplish that, and the rest comes much more easily. I have booked two film projects for the coming week, and I went on three more auditions yesterday. Line memorization has claimed almost all my free time. My CTA fare card is tapped out, and I have been going to bed exhausted at 10:00pm.